Senior Marci Heatherly was a key factor in Girard’s victory Monday as she finished 2nd scoring a 47. The Lady Trojans took 1st place overall. 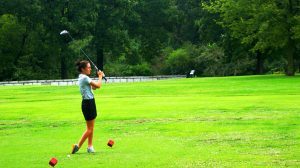 With rain out of the way and the sun covering the course, weather conditions were ideal as local girl’s golf teams battled it out at Four Oaks Golf Course, Monday, September 10. Girard’s girls’ team were sinking shots at the right time as it was neck and neck throughout the tournament. 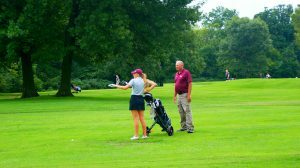 Senior Gabbi Sands effort helped Girard’s team Monday at Four Oaks Golf Course as she finished in 3rd scoring a 50. Seniors Marci Heatherly and Gabbi Sands were the focal point of the Trojans attack as Heatherly finished 2nd scoring 47 and Sands finishing right behind at 3rd scoring 50. 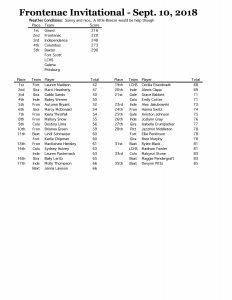 Other contributing efforts from the Trojans included junior Marcy McDonald finishing 6th scoring 54 and senior Bailey Leritz placing 16th scoring 65. These efforts helped the Trojans edge past Frontenac’s team beating the Raiders by a score of four points. The Trojan’s next tournament will be at Schifferdecker Golf Course in Joplin, Missouri, Thursday, September 13.